The consortium aims to invent and test a novel, precise and inexpensive method to monitor air contamination, especially by heavy metals. The MOSSclone partners from universities as well as small and medium enterprises situated across Europe collaborate to create this new biotechnological tool which will function as a passive contaminant sensor consisting of a devitalized moss clone. The MOSSclone project is funded by the European Union in the Seventh Framework Programme (FP7) for Research and Technological Development. We tested and compared the accumulation performance between bags filled with a Sphagnum palustre L. clone or with native Pseudoscleropodium purum Hedw. in urban, industrial, agricultural and background areas. Among the eighteen elements investigated, S. palustre was significantly enriched in 10 elements, while P. purum was enriched only in 6 elements, and had a consistently lower uptake capacity than S. palustre. The Sphagnum palustre clone proved to be more sensitive in terms of metal uptake and showed a better performance as a bioaccumulator, providing a higher accumulation signal and allowing a finer distinction among the different land uses and levels of pollution. Reski, R., E. Decker, A. Beike, S. Giordano, P. Adamo, M. Tretiach, V. Spagnuolo, R. Bargagli, J.R. Aboal Vinas, C. Real Rodriguez, J. Fernandez Escribano, A. Carballeira Ocana, P. Lopez Mahia, S.N. Muniategui Lorenzo, D. Prada Rodriguez, M. Pinero Iglesias, E. Concha Grana, A. Gonzalez Gonzalez, O. Pokrovsky, A.I. Rey Asensio, J. Ramos Gomez, J. Martinez-Abaigar, H.G. Zechmeister (2016): Passive contaminant sensor device used to sense air pollutants comprising polycyclic aromatic hydrocarbons or heavy metals or their compounds, comprises axenic devitalized moss clone. Patent EP3076171-A1; WO2016156443-A1. We propose a Sphagnum palustre clone as valid candidate for active biomonitoring. We therefore performed a chemical and molecular characterization of the clone. Five anonymous sequences and their primers were obtained as new molecular markers. Element concentration was stable and lower in the clone than in native S. palustre. Elemental composition was not significantly affected by oven and EDTA treatments. The Spanish website analaqua reported about the MOSSclone research project. The German magazine BIOPRO reports about the successful completion of the MOSSclone project. To optimize moss bags the effects of several variables on the metal uptake from the air were evaluated by a systematic experimental design carried out in urban, industrial, agricultural and background areas of three European countries with oceanic, Mediterranean and continental climate. Neither shape, nor mesh size of the bags nor exposure height significantly influenced uptake capacity. Element uptake was more influenced by the density of the moss inside the bags and the relative ratio between its weight and the surface area of the bag: The lower the density, the higher the uptake recorded. Scientists reccomend exposure periods not shorter than 6 weeks and a shared exposure protocol by the research community since it is a key aspect to make biomonitoring surveys directly comparable, also in view of its recognition as a monitoring method by the EU legislation. The adsorption of copper (Cu) on four devitalized moss species was studied under different experimental conditions such as a function of pH and Cu concentration in solution. Cu assimilation by living Physcomitrella patents was also investigated and found to be reduced. The four devitalized moss species exhibited the universal adsorption pattern of Cu as a function of pH. In the paper, scientists provide numbers of total binding sites, give adsorption capacities, and identified the main moss surface binding moieties. MOSSpheres are the device in which the cultivated mosses accumulate pollutants. The Biotech and Life Sciences Portal Baden-Württemberg in Germany, BioPro BW, introduces the “MOSSpheres” in which MOSSclone’s mosses are brought out in the field for biomonitoring pollutants. "MOSSclone: peat moss for measuring air pollution"
"MOSSclone: Torfmoos zur Messung der Luftverschmutzung"
J. Aboal, P. Adamo, R. Bargagli, A.K. Beike, M. Bowkett, F. Capozzi, C. B. Carballeira, E. Concha-Grana, D. Crespo Pardo, E. L. Decker, A. Di Palma, J. A. Fernandez, V. Fernandez, S. Giordano, A. G. Gonzalez, S. Iglesias-Samitier, P. Lopez Mahia, S. Muniategui, P. Piñeiro-Iglesia, O. S. Pokrovsky, R. Reski, A. I. Rey-Asensio, V. Spagnuolo, M. Tretiach (2015). Presented by Mauro Tretiach on 21 September 2015 at the Conference "Ecology at the Interface: Science-based solutions for Human well Being", Rome, Italy, which was organized by the European Ecological Federation (EEF) and the Società Italiana di Ecologia (S.It.E). Researchers compared natural and cloned Sphagnum mosses for proton and metal (copper and zinc) adsorption capacities. As they demonstrated, metal adsorption capacity of mosses were related to DOC excreted by mosses. Cloned S. palustre has high specific surface area and metal adsorption capacities. Overall, in vitro-produced clones of S. palustre can be considered as an adequate, environmentally benign substitution for protected natural Sphagnum sp. samples to be used in moss-bags for atmospheric monitoring. The paper was published in the Journal of Colloid and Interface Science. Matrix solid phase dispersion method for determination of polycyclic aromatic hydrocarbons in moss. Journal of Chromatography A. 1406: 1926. The Webiste of the University de la Rioja informs about the project, our Moss-Speres and offers a video "Mossphere permite medir la calidad del aire con un musgo: Desarrollado el primer instrumento biotecnológico que permite monitorizar la calidad del aire con un musgo." Universidad de la Rioja: "Mossphere permite medir la calidad del aire con un musgo"
Images explain the two key studies carried out by this research consortium to overcome the problems associated with the traditional moss-bag technique to measure air pollution. The Newsletter also summarizes the outcome of the last two meetings of the consortium at A Coruña in Spain and at Naples in Italy. The EUNETAIR Workshop at Riga (Latvia) is also reported about in the Newsletter. The final presentation is documented in which the MOSSphere and the MOSSclone method are shown to be useful tools to monitor air pollution. Both are now patent-pending. From March 9th to 11th 2015 the final Meeting of the MOSSclone Group will take place in the Congress Center Unina Federico II in Naples, Italy. The first day is devoted on internal discussions among consortium members about achieved results and future perspectives. The second day focuses on overall outputs and achievements. The workshop on that day is open to non-consortium technical operators, small and medium enterprises, stakeholders as well as researchers and informs about MOSSclone production and application of biomonitoring of air pollution. Who intends to take part to the two meeting days and the field trip on the third day is invited to send the registration form back before 9th February 2015. We established axenic in vitro cultures of the five peat moss species (Sphagnum fimbriatum, S. magellanicum, S. palustre, S. rubellum and S. subnitens) with specific focus on large-scale cultivation of S. palustre in bioreactors. For advanced production of S. palustre we tested different cultivation techniques and analyzed the effects of tissue disruption. The techniques are a suitable, sustainable way to produce S. palustre material for basic and applied research. The agenda and results of the 3rd WP leaders’ meeting are summarized. Photos depict some scenes of the event which took place at the Italian Abano Terme on 19th and 20th of September 2014. The Newsletter also provides an overview of the achieved goals of the MOSSclone Research Consortium and the tasks which are still in progress or will be carried out in the near future. It closes with an exposure protocol of the moss bags as well with maps which display the locations of the 20 exposure sites distributed over two countries where the moss bags will be tested. The issue summarizes the results gained by the Consortium so far. It provides an overview and photos from the second working project leaders' meeting which took place at Santiago de Compostela in November. The results of the standardization of the moss bags in which the moss will be exposed to measure air quality are summarized: their mesh, shape, weight-surface ratios, the time of exposure as well as the optimal height for exposure. According to the recommendations drawn from the results mentioned samples of the cloned mosses are now simultaneously being exposed with traditional detectors in Spain and Italy. El Mundo, the largest digital Newspaper in Spain, reported about the MOSSclone project with the headline: "El musgo, un aliado para medir la contaminación atmosférica". A Spanish video of two minutes at the website of the Galician TV station Televisión de Galicia introduces the work of two of the European MOSSclone partners: Ana Isabel Rey Asensio talks about the part the Spanish Biovía company is taking care of and Prof. Simonetta Giordano explains what she and her group at the Italian University at Naples are contributing to the reach project's aims. On 29th and 30th of November 2013 the leaders of the working projects will meet in Santiago de Compostela, A Coruña (Spain). The event is organized by Ana I. Rey Asensio, Julia Ramos Gómez, Verónica Fernández González and Carlos B. Carballeira Braña. The moss plants swimming in this bioreactor all derive from the spores of a single sporangium capsule of a single Spagnum palustre plant from northern Germany. The cultivation of single clones makes it needless to harvest specimens from the wild. Plants raised under this controlled laboratory conditions will provide the standardized raw material which is needed to detect pollutants in picogram quantities. In the tests by the MOSSclone research consortium the peat moss S. palustre had turned out to be the most suitable candidate to accumulate pollutants from the air and therefore was chosen to be multiplied. Images and the agenda of the consortium's mid-term meeting at Freiburg (Germany) are provided in this newsletter. Moreover project manager Carlos Carballeira summarises main achievements of the research consortium as well as of the mid-term meeting which took place end of September. He reports that the species Sphagnum palustre was chosen to be cloned from now on after several species were tested. The next steps will be the up-scaling of the cultures. A map shows the locations where the samples were exposed to different types of air pollutions across Europe. The newsletter also compares native and cloned mosses and describes the tasks which are now in the focus of the research consortium. A list of media coverage rounds off this issue. Developing a new procedure to use moss as a sensor for the measurement of pollutants in the air: that is the aim of the "Mossclone" project which is being funded by the European Union (EU) as part of its Eco-Innovation Programme. 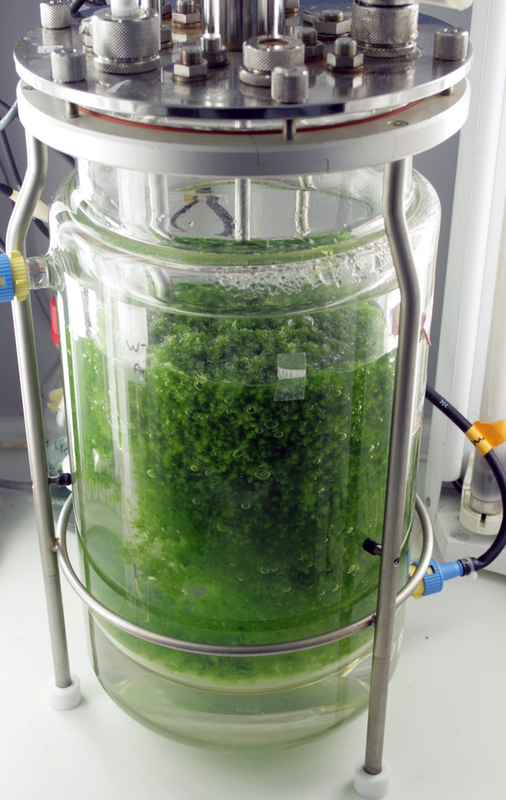 After one and a half years the international research group run by Biologist Prof. Dr. Ralf Reski from the University of Freiburg/Germany has achieved the first milestone by preparing the lab-scale produced mosses to be cultivated in large bioreactors. A midterm review with all partners is being held at the Freiburg Institute for Advanced Studies (FRIAS) from 26th - 28th September 2013. The meeting will kick off with a talk by one of the Advisory Board members Dr. Harald Zechmeister on why moss is suitable for studying the effects of climate change. The Assistant Professor from the Department of Conservation Biology, Vegetation and Landscape Ecology at the University of Vienna/Austria will illustrate how rises in temperature as well as in carbon dioxide and nitrogen affect moss colonies in the wild. The first video reporting about the European research collaboration was made by the news channel Euronews. Dr. Eva Decker explains why mosses are good candidates to measure air pollution. The analysis of airborne heavy metals is unreliable and expensive up to now but required by law. Prof. Dr. Ralf Reski says in which way biotechnology helps to create standardized moss material - a precondotion to reliably measure contaminations. The first prototypes of air-permeable moss bags are now in a practical test in Spain where Dr. Carlos Carballeira Braña shows in which way the tests are run to measure pollution from cars, other vehicles and industrial plants. Inspired by first results Prof. José Angel Fernández Escribano provides an overview about other places and ecosystems that could be monitored in the future as soon as this new technique is approved - a technology which combines molecular biology and material sciences with ecology and bionics. A summary of the first WP leaders meeting at Naples, Italy, is given, which focused on the scientific activities of WP2. A summary of main achievements of the meeting is also provided and the concerns of the WP3 tool development are listed such as the criteria for identification and selection of exposure sites, the exposure protocols etc. A map illustrates the three sites distributed across Europe where the moss bags will be tested. The Newsletter finally lists recent, current, and upcoming tasks of the MOSSclone Research Consortium. The official MOSSclone Midterm Meeting will take place in Freiburg, Germany, September 26th-28th 2013. Hosts will be Ralf Reski and the Freiburg Institute for Advanced Studies (FRIAS: www.frias.uni-freiburg.de/home-en/view?set_language=en). The objectives as well as recent, current, and upcoming research tasks of the MOSSclone consortium are presented. A short note informs about the first kick-off meeting of the experts working in five European countries (Spain, Italy, France, Ireland and Germany) and introduces the participating eleven institutions. A list of recent publications rounds of the first MOSSclone Newsletter. The literature review of moss species revealed the most appropiate species belong to the genus Sphagnum. Article in Spanish about the MOSSclone project in the Xornal de USC (University Santiago de Compostela). More articles about the project can be retrieved at from the outreach section. News about the MOSSclone project will appear on Twitter via the account @ReskiLab. Since all messages will contain #Mossclone they will be easy to follow. An open Facebook group MOSSclone was founded. The first meeting of the researchers who are working in the consortium will take place from 10th to 11th May 2012 at the University de Santiago de Compostela (USC), Spain. They will outline basic procedures and define next steps of research.